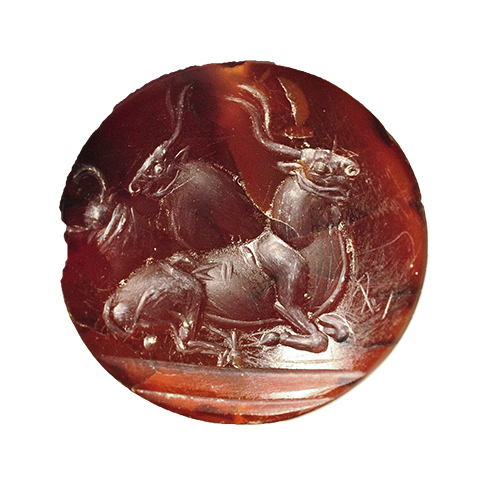 In 2015, in a work trailer at the site of an archaeological dig in Pylos, Greece, conservator Alexandros Zokos was meticulously cleaning artifacts with distilled water and ethanol when he came across a tiny sealstone, 1.4 inches long, made of agate. The brown-and-white marbled stone, one of more than 2,000 items that Cincinnati-based husband-and-wife archaeologists Jack Davis and Sharon Stocker had extracted from a 3,500-year-old gravesite nearby, closely resembled a bead, smooth and unadorned on one side and encrusted in calcium and lime on the other. On the Greek island of Crete, such stones would have been pressed into soft clay sealings on boxes, baskets, or rolls of papyrus, or used to mark a high-ranking person’s identity. But here on the Greek mainland, where society is thought to have been less evolved at the time, they were often repurposed in jewelry. This particular stone had been found face-down in the dirt near the skeletal remains of a man’s right arm, many other sealstones, and four gold signet rings. Historians and archaeologists were already blown away when Stocker, a University of Cincinnati senior research associate, and Davis, head of UC’s classics department—“both well-known figures in the archaeological world,” says University of Missouri–St. Louis professor of archaeology Michael Cosmopoulos—found the circa 1450 B.C. grave in the first place, in an area where iconic UC archaeologist Carl Blegen had dug test trenches in the 1960s and “found squat,” says Davis. They were amazed again, just two months later, when Davis and Stocker revealed the discovery of those four pristinely preserved signet rings beside the remains of a man who had since been nicknamed “The Griffin Warrior” (for an ivory plaque with a griffin, a mythical mashup of lion and eagle, that the pair found between his leg bones). Now, they were astounded at the discovery of this extraordinarily small and precise piece of artwork, the likes of which had never been seen before. Until now, historians thought Greek artists weren’t capable of creating such realistic and detailed art, let alone on such a small scale, until at least 500 B.C. 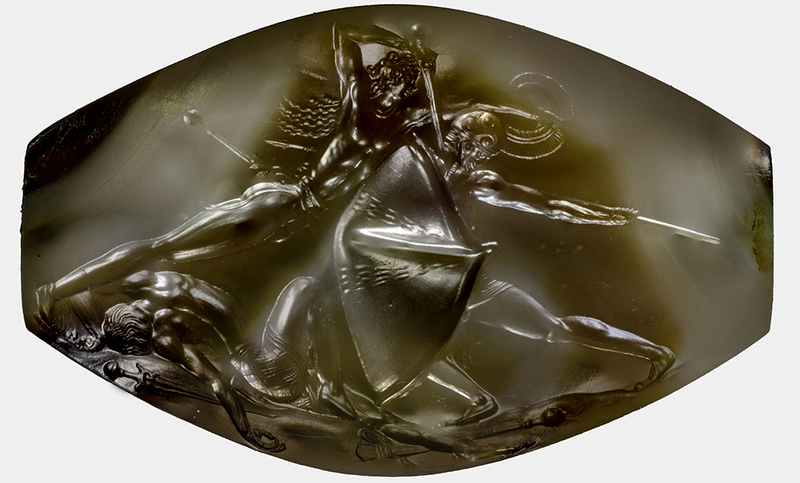 The existence of this tiny stone (now known as the Pylos Combat Agate) 1,000 years earlier blew that theory out of the water. 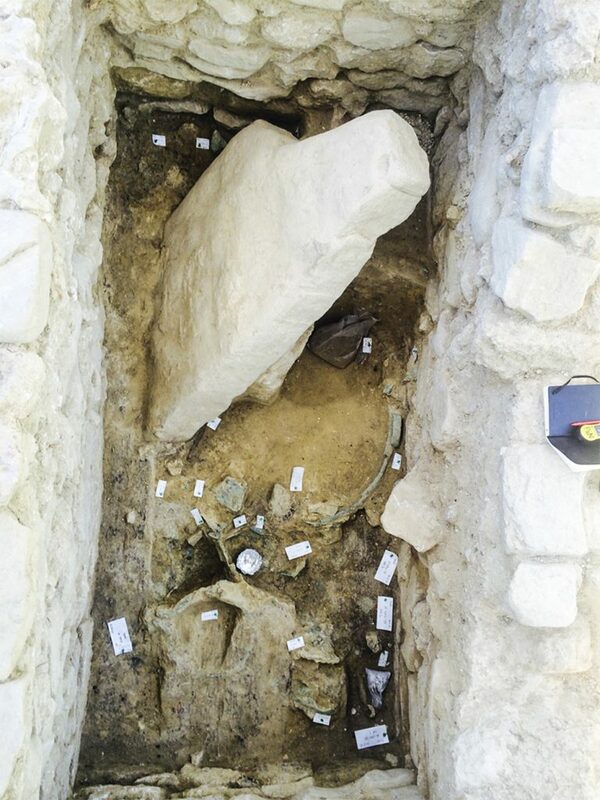 It also began raising more questions: Why had no one ever discovered the grave before? Who was this man, to have been buried in his own personal grave alongside such riches? And how did someone make something as detailed as the Combat Agate as early as 1450 B.C.? Add in the fact that Davis and Stocker, who have worked on digs in the area for three-plus decades, really hadn’t expected to find anything like this in their lifetimes—certainly not on this particular site—and you have a tale both epic and irresistible that’s tinged with mystery and fully capable of altering history as we know it. The best part of the story is that Stocker and Davis didn’t even want to dig on this piece of land in the first place. They were looking for houses in the town that surrounded the Palace of Nestor, a remarkably well preserved 13th century B.C.E. palace that played a significant role in Homer’s Odyssey and had been discovered by Carl Blegen and another archaeologist in 1939. The land they wanted, in a place called Dimopoulos Field, was unavailable, so Greece’s Ministry of Education, Research, and Religious Affairs granted them a permit in a field near an olive grove that the Greek state owned, located in the 120-meter span between Dimopoulos Field and the Palace of Nestor. Based on Blegen’s earlier explorations, the couple didn’t have high hopes. They chose eight different places where their initial team of 35 grad students, archaeologists, and volunteers would help dig exploratory trenches. This particular location, “Trench N-C02,” was included because someone had noticed stones protruding from the ground and wondered what they were. Three days into the dig, Stocker and Davis were shocked when those stones morphed into the outline of a grave. Seven days after that, the couple was sitting in a bank when they received a message from UC student Flint Dibble, saying, “You’d better come quickly—we’ve found bronze,” says Stocker. 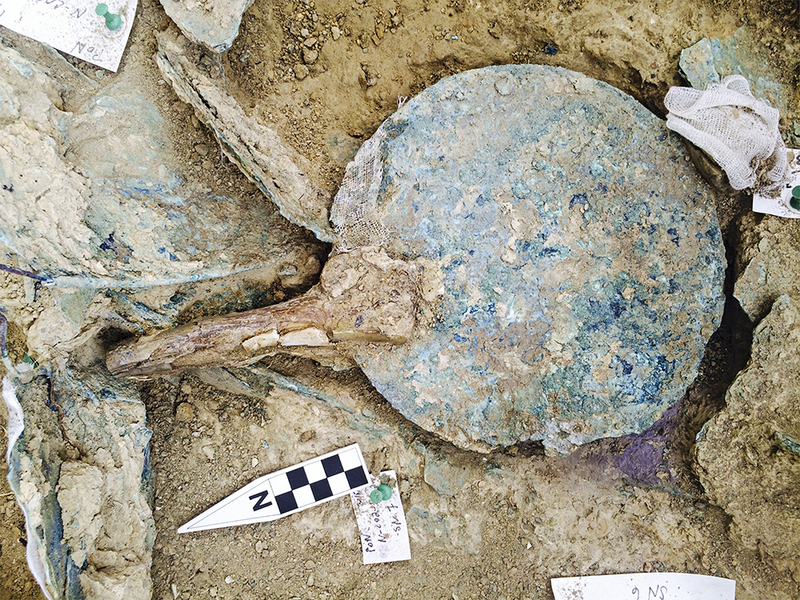 Turns out Dibble and fellow UC student Alison Fields had just uncovered the first of more than 2,000 grave goods the tomb would eventually yield—a sizable bronze basin. “We were wildly happy on the one hand,” says Davis. But the pair’s gut reaction was just as much “Ah, crap!” as anything, he adds, noting that a find like this is “both a blessing and a curse.” For starters, they were already two weeks into a six-week permit, “and this looked like a lot more than six weeks’ work,” he says. He was right. The excavation would end up lasting six months. Plus, the presence of precious metals required round-the-clock security. Grave looting is a popular pastime with some locals; Stocker still shudders at the thought of a gold necklace they had to leave in the ground for nearly four months because it was wrapped around an embedded bronze cup. Those weren’t the only complications. Most of their team had to leave after six weeks. It rained much more than normal that summer—they had to dig drainage channels around the grave and cover it with polyurethane so it wouldn’t fill with water. With so many pieces requiring conservation, the cost of the dig became “astronomical,” says Stocker. (She and Davis—not UC—raise every penny to fund the dig themselves, in the form of donations from both foundations and individuals.) The two people in charge were suddenly facing a lot more challenges than they’d anticipated. Still, for an archaeologist, finding a single undisturbed and un-looted grave this old—especially one with everything from weapons to hair combs to gemstones and precious metals like bronze and gold inside—is rare, almost akin to winning the lottery, not because of the payout (there is in fact no official monetary reward for such a find from the Greek government, UC, or anyone else) but for the prestige and honor and new glimpses into historical data and information such discoveries provide. 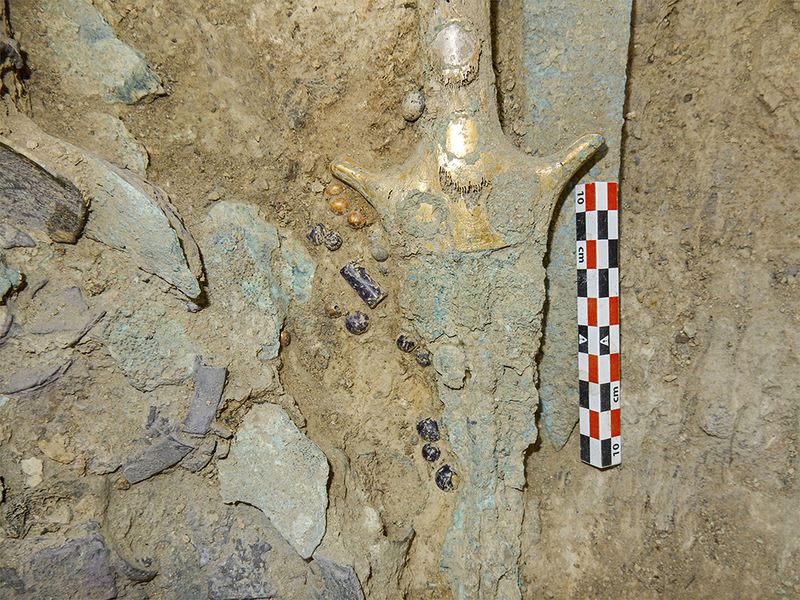 “The importance of this tomb—wow—it’s hard to even start counting the ways,” says George Washington University professor and archaeologist Eric H. Cline, a former colleague of Davis and Stocker. “The gold in some ways is the least of it.” Ironically, the thing that saved this tomb was the fact that a massive stone from its original roof had fallen inside, crushing the corpse as the coffin decayed but also sealing the grave permanently. Eventually, Stocker speculates, earth filled in on top of it and nobody even knew it was there. The University of Cincinnati’s archaeology program—part of its classics department, which dates back to the early 1900s—is “undeniably one of the top classical archaeology programs in the country,” says Cosmopoulos, who’s also worked extensively in the Pylos area. It’s also no stranger to important digs, especially in Greece—case in point, Blegen’s 1939 discovery of the Palace of Nestor, the “most impressive and prolific site” in Pylos, says Cosmopoulos, and “one of the greatest all-time finds of archaeology,” says Davis—not just for how intact it was, but for the more than 1,200 clay tablets held within its walls that led to the eventual deciphering of the ancient Greek language Linear B. By moving “the stone rather than [the] tool,” she adds, the artist would have more control during the carving process. And magnification wouldn’t have been an issue, says Stocker, because artisans—even today—who carve hard stones in a similar way use “slurry water” to keep the stone lubricated, “so you can’t see what you’re doing anyway.” Still, the thing to keep in mind here is that all theories, including those of the Athens-based goldsmith, are just conjecture; nobody really knows for sure how someone would have made something like this 3,500 years ago because “so far as we know,” say Davis and Stocker, “the Greek mainland had no written language at this time.” In other words, unlike ancient Near Easterners and Egyptians, who the pair says “have much longer histories of writing,” mainland Greeks in 1450 B.C. had no alphabet—no means of passing down specific information, except with pictures and stories. Meantime, the grave itself has since been “backfilled with earth,” say Stocker and Davis, “to protect the walls from eroding” (in a perfect world, the pair would raise enough money someday to build a small shelter overhead so it could be re-opened for visitors). Every artifact Davis and Stocker removed from the grave is “property of the Greek state and remains in its possession,” they note, adding that “all of what we found will eventually be put in [Greek] museums.” If any artifacts ever do make it to the United States, they would be “more likely to end up [on exhibit] at a major museum in New York City or Los Angeles” than here, says Davis. How has becoming rock stars in the archaeology world changed the couple’s lives? “Well, I have gray hair [and] I didn’t have any before this started,” says Stocker, who has lived and worked in Greece roughly 10 months out of every year since 2007. (Davis joins her on school breaks and in summers.) Sometimes, the pair also feels overwhelmed by well-meaning members of the public and the press, both of which have shown a nearly unquenchable thirst for news on the dig. Without the help of a full-time staffer, Stocker and Davis handle most correspondence and media requests themselves. Davis and Stocker will continue publishing indefinitely about their finds—they’re aiming for one article per year, because they want to disseminate the information as quickly as possible. “We want to have a chance to say what we think” before the world’s scholars redirect the discussions, says Stocker. Case in point: one Eastern European historian has already contacted them saying the pair’s findings validate his own research about “relationships between Greece and Egypt,” says Stocker. 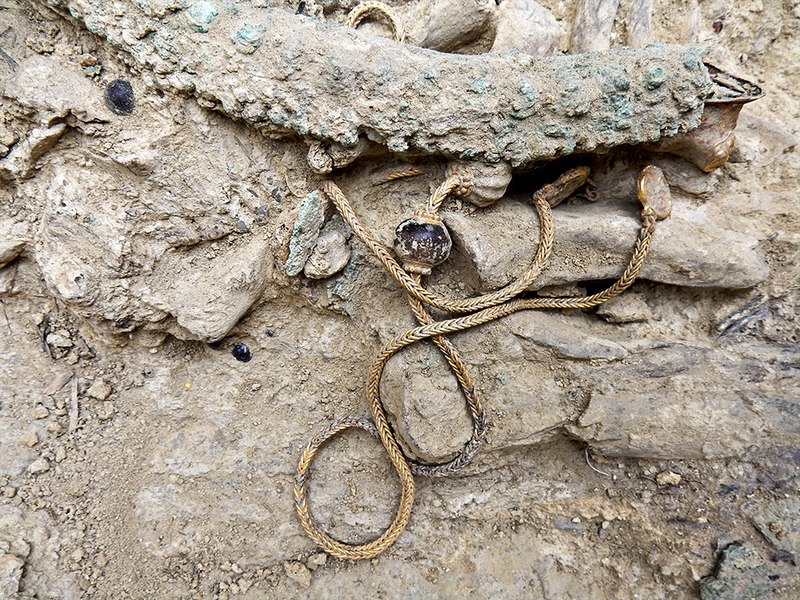 The couple could also easily spend the rest of their lives conserving, studying, and cataloguing all the items they found, though Stocker is also quick to note that the six months they spent excavating the site “are the beginning of 20 lifetimes worth of work. I mean, they’ll be working on this long after we’re gone and then some.” And they’re finally digging at their first choice location, Dimopoulos Field, through 2019. After that, they plan on spending as much time as possible in an apartment they recently bought in Athens, as Davis eyes retirement in five or six years. The best way to describe how an archaeologist views a find of this magnitude, he adds, is this: “The general public thinks either we already know everything or we don’t know anything. [But] we in the field know how much we don’t know. 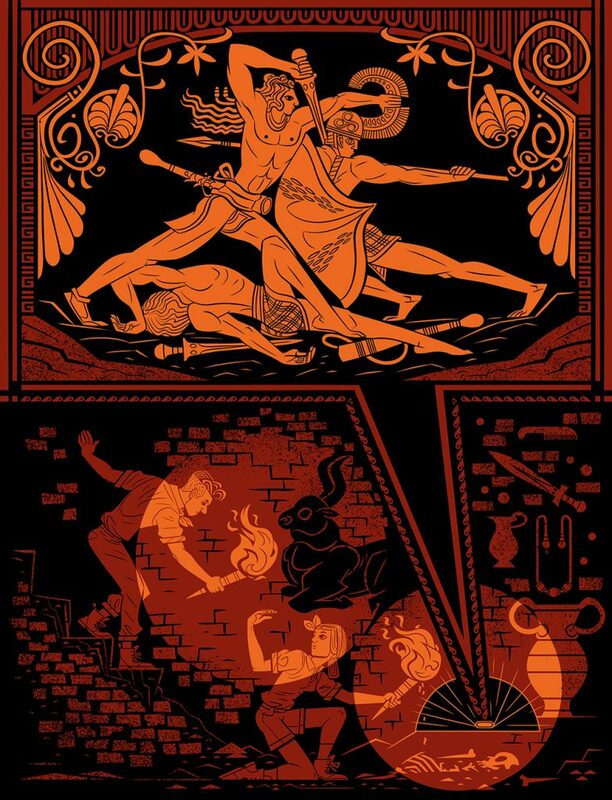 When Jack and Shari find this tomb [we think], ‘Great! Another piece of the puzzle.’ [But] we’re still just seeing a partial picture of the past.” One small glimpse into one person’s life at one very specific point in time.